Hey folks! I've got a new-to-me brand to show you today! Apparently, I was in the mood for blue stuff when I picked out my first Ruby White Tips polishes. I also managed to select two colors that are difficult to photograph, but I did my best and included more pictures than I usually do. 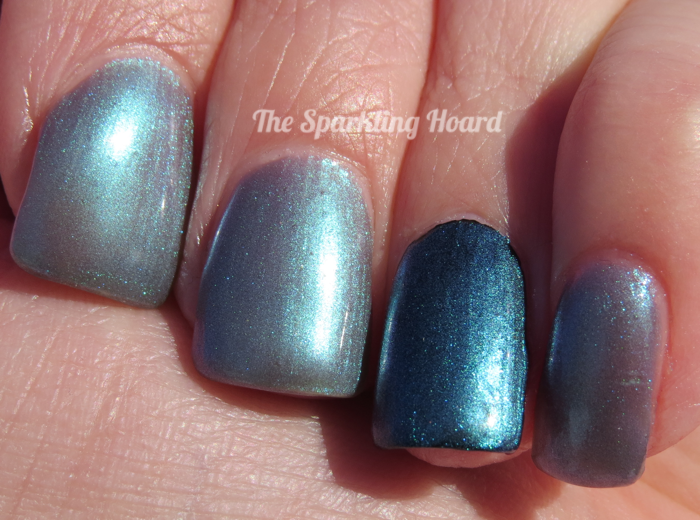 If you like these swatches, be sure to scroll down to the bottom of this post for a coupon code! 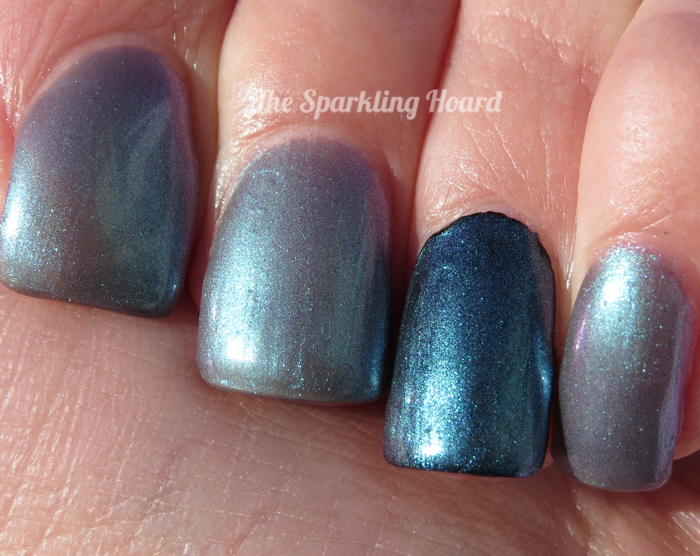 Jane's Lemming features a taupey brown base filled with bright blue shimmer. It's a cool twist on a neutral/natural color! 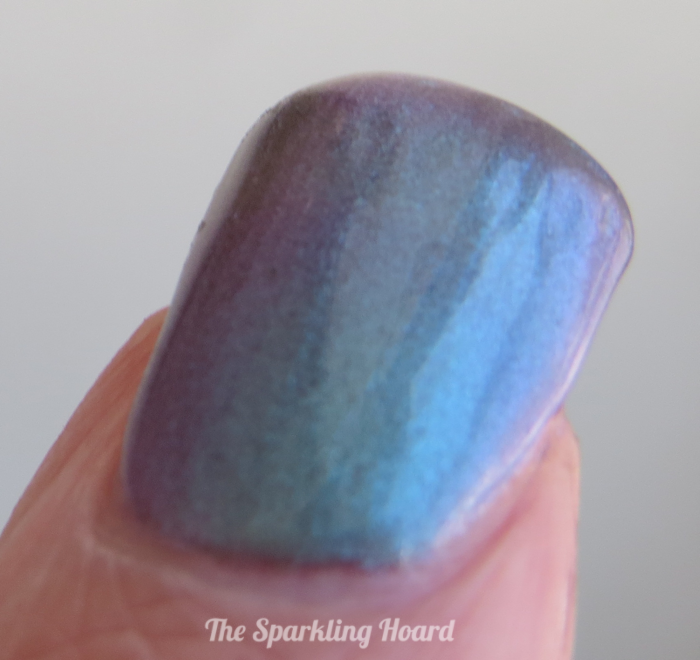 The shimmer was a bit tricky to photograph, but it shows up nicely in person. This polish is on the thicker side, but not in a bad way. It has sort of a unique consistency (like a smooth, flowing jelly) that makes it easy to paint your nails because it stays where you put it and doesn't run down into your cuticles. Dry time was a little on the slow side. 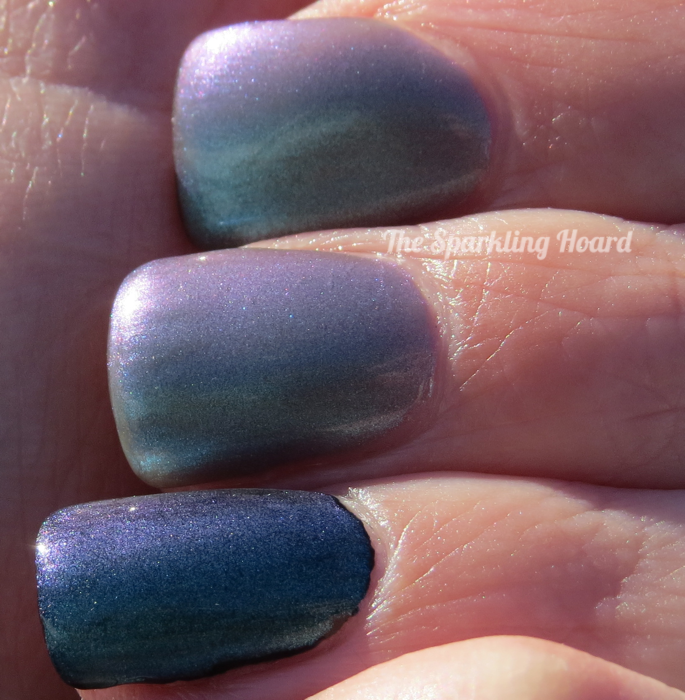 Here Piggy Pig Pig is a green-tinged icy blue/purple color shifting polish. It's a very eerie, ghostly color, which is perfect because it was inspired by the ghost-filled first season of American Horror Story! The purple shift isn't immediately apparent, but you will catch glimpses of it as you go about your day. It was very hard to catch this shift in photos, and the only shots I was able to get of it turned out a bit blurry. It definitely exists, though! You can layer it (I layered it over black on my ring finger), but I much prefer to use 3 coats of it on its own. It has the same consistency and formula as Jane's Lemming, so it applied nicely. Dry time was a little on the slow side. Jane's Lemming costs $9 for 15mL and Here Piggy Pig Pig costs $9.75 for 15mL. Ruby White Tips polishes can be purchased from the brand's Etsy shop. Be sure to use the coupon code SPARKLING for 10% off you order (valid until March 31, 2014)! To stay up-to-date on the latest news from Ruby White Tips, be sure to Like the brand's Facebook page and sign up for their newsletter! Products purchased by me using a blogger discount. If you use my discount code, it earns me credit towards more polishes. What a cool color to layer over with! I should play with layering it over various colors!